Expression of the retinoic acid receptor β2 (RAR-β2), a putative tumor suppressor gene, is reduced in various human cancers, including squamous cell carcinomas (SCC) of the uterine cervix. The mechanism of the inhibition of RAR-β2 expression remains obscure. We examined whether methylation of RAR-β2 gene could be responsible for this silencing in cervical SCC. Expression of RAR-β2 mRNA and methylation status of the 5' region of RAR-β2 gene were examined in 20 matched specimens from patients with cervical SCC and in three cervical cancer cell lines by Northern blot analysis and methylation-specific PCR (MSP) assay or Southern blot analysis respectively. In 8 out 20 cervical SCC (40%) the levels of RAR-β2 mRNA were decreased or undetectable in comparison with non-neoplastic cervix tissues. All 8 tumors with reduced levels of RAR-β2 mRNA expression showed methylation of the promoter and the first exon expressed in the RAR-β2 transcript. The RAR-β2 gene from non-neoplastic cervical tissues was mostly unmethylated and expressed, but methylated alleles of the gene were found in three samples of the morphologically normal tissues adjacent to the tumors. Three cervical cancer cell lines with extremely low level of RAR-β2 mRNA expression, SiHA, HeLA and CaSki, also showed methylation of this region of the RAR-β2 gene. These findings suggest that methylation of the 5' region of RAR-β2 gene may contribute to gene silencing and that methylation of this region may be an important and early event in cervical carcinogenesis. These findings may be useful to make retinoids more effective as preventive and therapeutic agents in combination with inhibitors of DNA methylation. Vitamin A and its biologically active metabolites, the retinoids, are essential for the maintenance of normal epithelial differentiation . Retinoid-deficient epithelial tissues acquire a premalignant phenotype, which is characterized by enhanced mitotic activity and loss of differentiation . Retinoids have been used as chemopreventive and chemotherapeutic agents for various human cancers . The antiproliferative and differentiative effects of retinoids are mediated through two classes of nuclear receptors, the RARs and RXRs. Both classes consist of three members, α, β and γ . All these receptors are ligand-activated transcription factors. They activate transcription by binding to retinoic acid response elements (RAREs) located in the promoter regions of the target genes. One of the targets of retinoid receptors is the RAR-β gene itself. The RAR-β gene encodes for four transcripts and is expressed in normal epithelial tissue, where its expression is up-regulated by treatment with retinoic acid (RA) [5, 6]. Recent studies have demonstrated that in many malignant cell lines derived from various carcinomas the level of RAR-β2 mRNA (one of four transcripts of this gene) is decreased or undetectable [7–9]. A decrease of RAR-β2 mRNA level (compared to normal tissues) was also observed in carcinomas of cervix , and in carcinomas of head and neck . These findings indicate that the specific loss of RAR-β2 mRNA expression may be an important event in tumorogenesis. This hypothesis has been supported by an observation that RAR-β2 can function as a tumor suppressor gene in two different carcinoma cell lines [12, 13]. Thus, a defect in RAR-β2 expression may be one of the events that lead the tumor cells to the escape from growth regulation. The etiology of cancer of the uterine cervix has been associated with several types of human papillomaviruses ("high-risk" HPVs) . In addition to growth regulation, the product of RAR-β gene can inhibit transcription of the viral oncogenes (E6 and E7 genes) in high-risk HPV-immortalized cells . The decrease of the expression of negative regulator of viral oncogene may be an additional important step on the way towards malignant progression of HPV-positive cells in this case. It has been shown that the retinoic acid can induce an increase of RAR-β2 expression in carcinoma cells  and in lesions of the oropharynx . RA treatment has inhibited transformation of human keratinocytes by HPV-16  and has enhanced regression of cervical moderate dysplasia . Beneficial effects of RA treatment of advanced cervical squamous cell carcinomas (in combination with interferon α) have been demonstrated in clinical trials . On the other hand, the existence of retinoic acid-insensitive cancer cell lines, including cervical carcinoma cell lines, and the lack of clinical effects of retinoids treatments in some cases are well established [21, 22]. The mechanism of the down-regulation and the loss of RA-inducible expression of RAR-β2 in cervical carcinomas and cell lines derived from them is not well understood yet. Recent findings have shown that hypermethylation of the promoter region is implicated in the transcriptional silencing of many tumor suppressor genes and several other genes functionally important in neoplastic process . The promoter regions of many genes, including RAR-β2, contain CpG islands, that are protected from methylation in normal cells . Aberrant methylation of CpG islands in tumors serves as an alternative pathway (in addition to intragenic mutations and loss of chromosomal loci) for complete inactivation of tumor suppressor genes. Hypermethylation of normally unmethylated CpG islands in the 5' region of the RAR-β2 gene has been observed in breast and colon cancer cell lines, that do not express RAR-β2 mRNA [25–29]. In this study we examined whether the methylation could be responsible for the deficit of RAR-β2 gene expression in cervical squamous cell carcinomas. Specimens of cervical tumor were collected in the Department of Radiosurgery of Russian Cancer Research Center: 20 specimens of invasive squamous cell carcinoma with low and moderate levels of differentiation and I, II and III FIGO stages and 20 specimens of morphologically normal tissues of cervix from the same patients. All tumors were HPV16- or HPV18-positive by PCR analysis. The human cervical carcinoma cell HeLa, SiHa and CaSki (American Type Culture Collection, Rockville, MD) were maintained in DMEM, supplemented with 10% FCS and 2 mM glutamine. DNA and RNA were isolated from frozen tissues homogenized in the 4.5 M solution of guanidine thiocyanate by centrifugation through cesium chloride cushion, as described previously . 10 μg of total RNA was fractionated in 0.8% formaldehyde agarose gel and transferred to "Hybond C extra" nitrocellulose membrane (Amersham, UK) according to Sambrook et al. . The membranes were hybridized with 32P-labelled 650 bp and 610 bp EcoRI fragments of RAR-β2-specific DNA. In order to control the relative amounts of RNA the membranes were hybridized to glyceraldehyde-3-phosphate dehydrogenase (GAPDH) DNA probe. Hybridization was performed in 5 × SSC at 42°C in the presence of 50% formamide. The membranes were washed in 2 × SSC, 1% SDS at 65°C and were exposed to X-ray film at -70°C. 10 μg of DNA was digested overnight with MspI or HpaII restriction enzymes (10 units/μg of DNA, SibEnzyme, Novosibirsk, Russia). The restriction fragments were separated in 1% agarose gel, transferred to nylon membrane (Zeta-Probe, Bio-Rad, USA) and hybridized with 32P-labelled PCR DNA probe. PCR DNA probe was prepared by PCR amplification of a 680 bp fragment of RAR-β2 promoter and exon_3 with primers: forward, 5'-ATT TGA AGG TTA GCA GCC CG and reverse 5'-CAT TCG GTT TGG GTC AAT CC, in the following conditions: 94°C for 3 min, 30 amplification cycles (94°C, 30 sec; 56°C, 30 sec; 72°C, 1 min) and 72°C, 5 min . Hybridization and washing conditions were as described for RNA. Bisulfite conversion reaction was carried out according to S.J. clark et al. with minor modifications. DNA (2 μg) was digested with RsaI restriction enzyme (SibEnzyme, Novosibirsk, Russia), denaturated by addition of NaOH to a final concentration 0.3 M, incubated for 15 minutes at 37°C and 3 minutes at 95°C, followed by cooling on ice. Sodium bisulfite and hydroquinone were added to the denatured DNA to final concentration 3.6 M and 0.5 mM, respectively. The sample was overlaid with mineral oil and incubated at 65°C for 16 hours. The DNA was purified using QIAEX II kit (Qiagen), desulfonated by addition of NaOH to a final concentration 0.3 M and incubation at 37° for 15 min, neutralized with 3 M ammonium acetate (pH 7.0), precipitated with 3 volumes of ethanol, resuspended in H2O and stored at -20°C. Primers that were specific for the upper strand of bisulfite-modified DNA and did not contain CpG dinucleotides in the original sequences were used in the first round of PCR: forward 5'-AAG TGA GTT GTT TAG AGG TAG GAG GG and reverse 5'-CCT ATA ATT AAT CCA AAT AAT CAT TTA CC . 5-20 ng of DNA was amplified with these primers in the following conditions: 94°C, 5 min; 35 amplification cycles (94°C, 15 sec; 53°C, 15 sec and 72°C, 30 sec) and 72°C, 5 min. The obtained DNA fragments were amplified in the second round of PCR with two set of primers specific for the upper strand of bisulfite-modified DNA, which contains CpG dinucleotides: 1) forward 5'-TTG AGA ATG TGA GTG ATT TGA and reverse 5'-AAC CAA TCC AAC CAA AAC AA for the unmethylated sequence (U), 2) forward 5'-TCG AGA ACG CGA GCG ATT CG and reverse 5'-GAC CAA TCC AAC CGA AAC GA for the methylated sequence (M). The PCR was performed under the following conditions: 94°C, 2 min; 40 cycles (94°C, 30 s; 50°C, 30 s and 72 °C, 30 s for U-primers) and 35 cycles (94°C, 30 s; 58°C, 30 s and 72°C, 30 s for M-primers) and 72°C, 5 min. The PCR products were fractionated in the 3% agarose gel and photographed. The level of the expression of RAR-β2 mRNA was evaluated in 20 samples of invasive squamous cell carcinomas of uterine cervix at low and moderate levels of differentiation and in the morphologically normal tumor-adjacent tissues of cervix in order to select a group of tumors with deficient expression of RAR-β2 (Figure 1B, Table 1). The level of RAR-β2 mRNA expression was significantly decreased in 8 out of 20 tumors constituting 5 – 48% of the expression level of the corresponding morphologically normal tissue. An extremely low (undetectable) level of mRNA expression was observed in one tumor, as well as in the adjacent morphologically normal tissue (Fig. 1B, lanes 5,6; Table 1, case 7). Thus, in 40% of cervical SCC the expression of the RAR-β2 mRNA was significantly decreased. An extremely low level of mRNA expression, wich was observed earlier in three cell lines HeLA, SiHa and CaSki , was confirmed in our experiment (data are not presented). A. Restriction map of promoter-exon region of RARβ2 gene for methylation-sensitive Hpa II enzyme. The bolt line shows the 680 bp DNA probe generated by PCR of the promoter and exon 3. The expected fragment sizes which are recognized by this probe are shown in the bottom part of the map. The transcription start site is indcated by broken arrow. The positions of the primers for MSP assay are indicated by arrows. The 146 bp fragment is the region analyzed for CpG methylation by MSP assay. The triangles show the positions of two RAREs within the promoter region. H – HpaII sites, the positions of the Hpa II sites in relation to the trascription start site are indicated by fugures in bp. B. Northern blot analysis of total RNA isolated from cervical carcinomas (T) and adjacent cervical normal tissues (N). 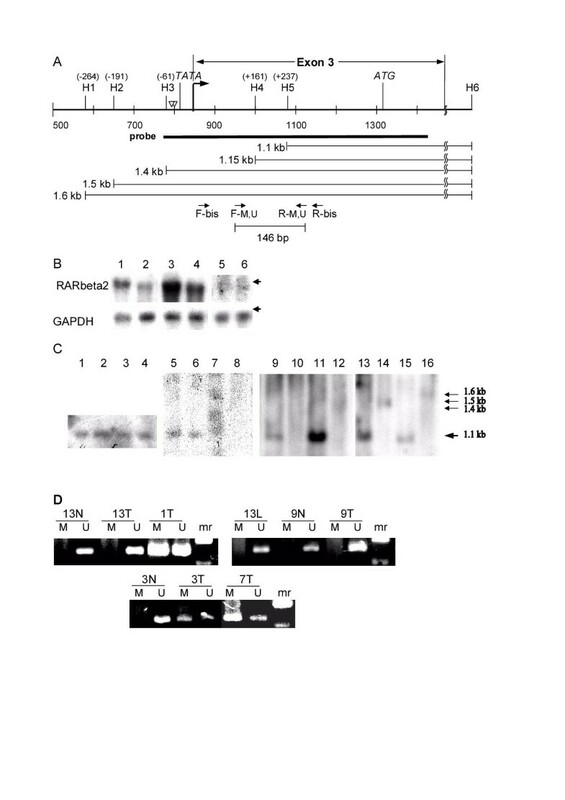 The blots were hybridized with 32P labeled DNA probes for RARβ2 and GAPDH. Lanes1, 2 – 4N, 4T, lanes 3, 4 – 5N, 5T, lanes 5,6 – 7N, 7T respectively. Case numbers correspond to that indicated in table 1. The arrows show the positions of 28S and 18S RNA. C. Southern blot analysis of DNA isolated from cervical carcinomas (T) and adjacent cervical normal tissues (N). The blots were hybridized with 680 bp 32P labeled DNA probe for RARβ2. The bold arrow shows the positions of a minimal 1.1 kbp fragment, recognized by this probe. Lanes 1, 3, 5, 7, 9, 11, 13, 15 – DNA digested by MspI; lanes 2, 4, 6, 8, 10, 12, 14, 16 – DNA digested by HpaII; lanes 1, 2 – 9N; lanes 3, 4 – 9T; lanes 5,6 – 4N; lanes 7, 8 – 4T; lanes 9, 10 – 7N; lanes 11,12 – 7T; lanes 13,14 – SiHa; lanes 15, 16 – HeLa. Case numbers correspond to that indicated in table 1. D. MSP assay of DNA isolated from cervical carcinomas (T), adjacent cervical normal tissues (N) and leucocytes (L). All DNA samples were treated with sodium bisulfite before amplification of a 146 bp fragment with methylation-specific primers (M) and unmethylation-specific primers (U). Sample numbers on the top of the gel correspond to that indicated in table 1; mr – molecular weight marker. The methylation status of the 5' region of the gene was studied in order to determine if this DNA modification, which inhibits transcription, contributes to the inhibition of the expression of the RAR-β2 mRNA. The study was carried out by two independent methods: by Southern blot analysis and by methylation-specific PCR assay. The localization of the recognition sites for the methylation-sensitive restriction enzyme Hpa II within the promoter region and the first transcribed exon of the RAR-β2 transcript (exon 3) is presented on the fig. 1A. The sizes of the fragments, which are produced when the restriction sites are methylated and can not be digested by Hpa II, are indicated in the lower part of the fig. 1A. The control digestion of DNA by Msp I (cuts at the identical to Hpa II site even if the cytosine residue is methylated) produced only one major band 1.1 kbp (Fig. 1C, lanes 1, 3, 5, 7, 9, 11, 13, 15). The absence of the 1.1 kbp band, as well as that of 1.15 – 1.6 kbp, after the digestion of the DNA by Hpa II indicates that the H1-H5 sites are methylated (Fig. 1C, lanes 8, 10, 12, 14, 16). The presence of 1.1 kbp band and the absence of any additional bands indicates that these sites are unmethylated (Fig 1C, lanes 2, 4, 6). As demonstrated by Southern blot analysis, all analyzed sites were methylated in 6 out of 8 carcinomas with the deficit of the RAR-β2 mRNA (Table 1). It was impossible to perform this analysis in two carcinomas due to lack of adequate amounts of DNA. Methylation of this region was found in the morphologically normal tissue in the case 7 (Fig. 1C, lane 10). This result correlated with the absence the mRNA expression in this samples (Fig. 1B, lane 5). Two cervical cancer cell lines, showed methylation of this region also (Fig 1C, lanes 14, 16). The same samples were subjected to the MSP assay. The MSP assay allows detection of methylated, as well as of unmethylated alleles after the modification of DNA by sodium bisulfite. The presence of nonmalignant cells (fibroblasts, blood cells and some normal epithelial cells) in tumor specimens does not interfere with the ability to detect methylation. The sensitivity of this assay to detect methylated alleles in the background of unmethylated alleles is > 10-4. The result of a typical experiment with a set of primers, that amplify a 146 bp product in the region of H4 and H5 sites of Hpa II (5' untranslated region, 5' UTR), is presented on the fig. 1D. The presence of an amplification product obtained in the reaction with methyl-specific primers (M) indicates for the methylation (Fig. 1D, samples IT, 3T, 7T). The absence of this product indicates for the absence of the methylated alleles (Fig. 1D, samples 13T, 9T, 13L and all N samples). Amplification with primers, which are specific for the unmethylated sequence (U), demonstrated that this region is mostly demethylated. It should be noted, that in all tumor samples, that bear the methylated alleles, we detected at least traces of the products of amplification with U primers. Apparently, the nonmalignant cells, that are present in tumor specimens serve as a source of this product. Both primer pairs (M and U) do not react with DNA, which was not treated with bisulfite (data not shown). Thus, the presence of an amplification product in the reaction with the U primers serves as a control of a correct DNA modification by bisulfite in the case of a negative reaction with the M primers. The results of the MSP assay confirmed the methylated status of DNA in the 5' UTR region of RAR-β2 gene in tumors with decreased level of mRNA expression and in all cervical cancer cell lines examined. (Table 1). In addition to one case, which was detected by Southern blot analysis, two patients were found to produce a poor amplification with the M primers in morphologically normal tissues (data not shown). Thus, methylation of CpG site in the promoter and the 5' UTR region of RAR-β2 gene was detected in all 8 tumor samples with deficient expression of the RAR-β2 mRNA and all cervical cancer cell lines. Methylation of this region was not found in the tumors with normal expression levels of the RAR-β2 mRNA. RAR-β2 is a putative tumor suppressor. Complete or partial inhibition of the expression of the gene was observed in many tumor cell lines and in primary human tumors [7–11, 22]. It was demonstrated in this study, that in 8 out of 20 SCC of cervix a deficient expression of the RAR-β2 mRNA was observed in comparison to the matched morphologically normal tissue of cervix. The mechanism of the inhibition of RAR-β2 expression remains obscure. It was demonstrated in the tumor cells lines derived from breast and colon carcinomas, that the expression of RAR-β2 mRNA is silenced by methylation of the promoter and the first exon, that is expressed in the RAR-β2 transcript. Treatment of DNA by demethylating agent 5-aza-2'-deoxycytidine restored the inducibility of the gene by all-trans-retinoic acid (ATRA) in many, but not all tumor cell lines. For breast carcinomas a relationship between methylation status and decreased RAR-β2 expression was found only in invasive grade II tumors. In grade III tumors the RAR-β2 expression was never observed, regardless the methylation status . In all 8 invasive SCC of cervix and in three cell lines, analyzed in our study, the deficit of the expression of the RAR-β2 mRNA was associated with methylation of the promoter and the region of the first exon, including the H3 site close to the RARE (Figure 1A). The methylation of this site plays an important role in the repression of the gene transcription in the breast cancer cells . However, recently 5 cervical cancer cell lines were revealed in that the inhibition of the RAR-β2 mRNA expression was not associated with the methylation of the same region of the gene . Apparently, some other events together with methylation of the promoter region are involved in gene inactivation in certain cancer cell lines and invasive carcinomas. In particular, overexpression of Nur 77 gene has been found to be associated with a loss of RAR-β2 inducibility and RA resistance in lung cancer cells . In our study the methylated alleles of RAR-β2 were absent in the majority of morphologically normal tissues of cervix. However, methylated alleles of the gene were found in three samples of the normal tissue, which were adjacent to the tumors with methylated status of RAR-β2. It can be suggested, that methylation of the normal tissues of cervix is an early preneoplastic event, that favours the development of malignancy. Our data provide only indirect evidence that methylation and the loss of RAR-β2 expression are early steps of cervical carcinogenesis. Recently this suggestion was supported by the study, where the methylated alleles of the gene were found in 11% and 29% of low grade and of high grade cervical intraepithelial neoplasias respectively . This authors found the methylation of RAR-β2 gene in 5 out of 17 invasive carcinomas also. Taken together these data indicate that methylation of RAR-β2 gene is frequent and early event during cervical cancerogenesis. These findings suggest that methylation of the 5' region of RAR-β2 gene may contribute to gene silencing and that methylation of this region may be an important and early event in cervical carcinogenesis. Cervical carcinomas may serve as a potential target for the DNA methylation inhibitors due to a close correlation between the deficit of RAR-β2 mRNA expression and methylation of this gene. These inhibitors in combination with retinoids might be clinically useful in future as chemopreventive and chemotherapeutic agents for patients with cervical dysplasias and carcinomas. Tatyana Ivanova, Anatolii Petrenko contributed equally to this work. We thank Dr. O.V. Sacharova for providing the clinical information and Dr. A.F. Kisseleva for technical assistance. This work was supported by grants 97-04-50140 and 01-04-49225 from the Russian Foundation of Basic Science.